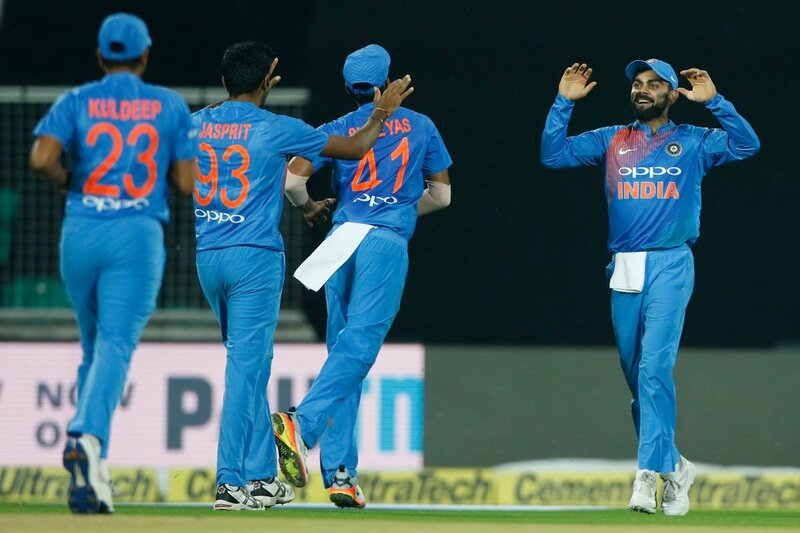 Thiruvananthapuram, Nov 7: India defeated New Zealand by six runs in the third and final Twenty20 International (T20I) to win the series at the Greenfield International Stadium here on Tuesday. The three-match series was locked 1-1 after the hosts won the opening match in Delhi while New Zealand clinched the second encounter in Rajkot. With heavy rain lashing the city, the start of the third T20I was delayed by a couple of hours and the match was reduced to an eight overs a side affair. Having restricted the hosts to 67/5 after winning the toss, the New Zealand batsmen struggled right from the start and could only manage 61/6 in their eight overs. Pacer Jasprit Bumrah was the most successful among the Indian bowlers with figures of 2/9 in his two overs. His fellow pacer Bhuvneshwar Kumar and left-arm spinner Kuldeep Yadav bagged a wicket each. The Kiwis had a poor start to their chase when Bhuvneshwar bowled opener Martin Guptill with a slower ball that swung away to hit the off-stump. Guptill was going for an ambitious heave through mid-wicket, but was beaten by the movement in the air. Colim Munro, the other New Zealand opener, departed in the next over when he holed out to mid on off a Jasprit Bumrah delivery. Kane Williamson and Glenn Phillips added 20 runs between them before both fell to consecutive balls. Williamson was run out thanks to an accurate throw by Hardik Pandya while Phillips was caught while attempting to hit Yadav against the turn. Henry Niholls fell while attempting a sweep of Bhuvneshwar only to pick out Shreyas Iyer at fine leg. Tom Bruce was run out later in that same over as the Kiwis tottered at 49/6 after seven overs. With 19 runs needed in the final over, Colin de Grandhomme did give the visitors a glimmer of hope when he smashed the third ball for a six. 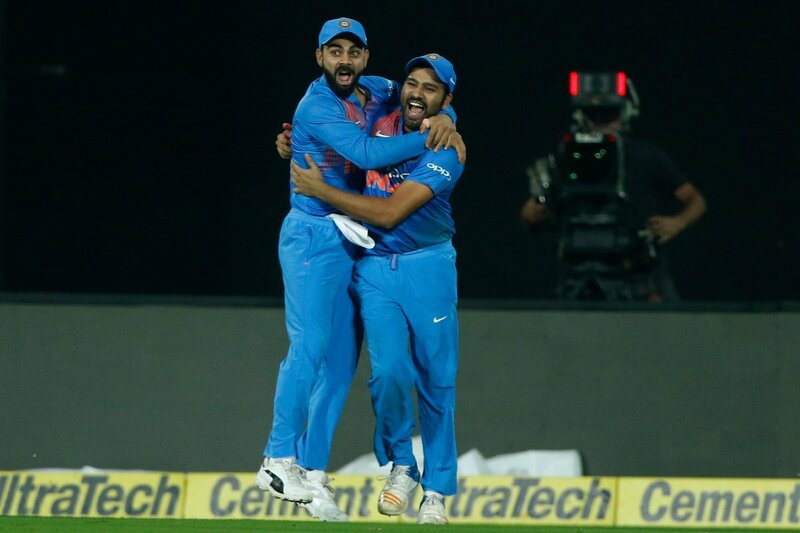 But with the Kiwis needing 12 runs off the last three balls, Bhuvneshwar bowled a tidy line to ensure that India won the match and the series. Earlier, India posted 67/5 in their allotted eight overs. Fast bowler Tim Southee bowled well for New Zealand with figures of 2/13 in his two overs. Leg-spinner Ish Sodhi copped some punishment from the Indian batsmen, but ultimately ended up with figures of 2/23. Fast bowler Trent Boult also bagged a wicket. Asked to bat first by the Kiwis, the hosts ran into trouble in the third over when Southee sent back openers Shikhar Dhawan and Rohit Sharma off consecutive deliveries. Indian skipper Kohli had a promising start, smashing leg-spinner Ish Sodhi for a boundary and a six off back to back balls before falling later that same over while attempting to send another delivery into the stands. Sodhi bagged another wicket in his next over when Shreyas Iyer mistimed his shot and holed out to Guptill at long off. With Hardik Pandya and Manish Pandey looking dangerous with the bat, it seemed that India will go past the 70-run mark. But Boult produced an excellent final over to contain the hosts to a manageable total. Pandey was caught at the boundary by an excellent fielding effort by Colin de Grandhomme and Mitchell Santner while attempting to hit a Boult delivery out of the park. Santner had made the initial catch but even as he was falling to the ground he lobbed the ball to de Grandhomme. New Zealand: 61/6 (Colin de Grandhomme 17 not out; Jasprit Bumrah 2/9) vs India: 67/5 (Manish Pandey 17; Tim Southee 2/13, Ish Sodhi 2/23).